Workers of the World Faint! 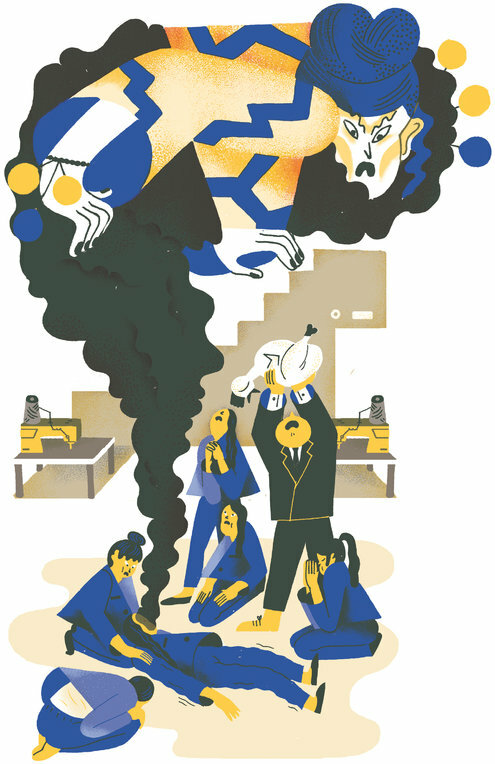 PHNOM PENH, Cambodia — Just over two years ago, at the Anful Garments Factory in Kompong Speu Province, a young worker named Chanthul and 250 of her colleagues collapsed in a collective spell of fainting. They had to be hospitalized; the production line shut down. Two days later, the factory was back up, and the mass faintings struck again. A worker started barking commands in a language that sounded like Chinese and, claiming to speak in the name of an ancestral spirit, demanded offerings of raw chicken. None were forthcoming, and more workers fell down. Peace, and production, resumed only after factory owners staged an elaborate ceremony, offering up copious amounts of food, cigarettes and Coca-Cola to the spirit. This episode, however bizarre, was not singular. In the past few years, Cambodia has experienced a slew of mass faintings among garment workers: One after the other, hundreds of women have fallen to the floor of their factories in a dizzy spell called duol sonlap in the Khmer language. The swooning has been attributed, variously, to heat, anemia, overwork, underventilation, chemical fumes and food poisoning. But according to one group of medical anthropologists and psychologists who have studied the phenomenon, two-thirds of these episodes are associated with accounts of possession by local guardian spirits, known as neak ta. The mass faintings have paralyzed production, to the consternation of the government, factory owners and international clothing retailers. The United States opened its market to Cambodian exports in the 1990s, and the garment industry in Cambodia has since become a $5 billion-a-year business. According to the country’s Garment Manufacturers Association, there are now over 600 garment factories, most owned by Taiwanese, Korean, Chinese, Hong Kong and Singaporean companies. Many were hastily erected on the dusty outskirts of Phnom Penh and in a few other free-trade zones — on land where people believe neak ta have lived for generations. Although Theravada Buddhism has been the official religion of Cambodia since the 13th century, it never supplanted the existing pantheon of ancestral spirits, local gods and Brahamanic deities. Perhaps the most important of these is the neak ta, a spirit strongly associated with a specific natural feature — a rock, a tree, a patch of soil. These spirits represent a village-based morality and are inseparable from the land. This connection is so strong that in past times even some kings were seen to be merely renting the land from neak ta. Like those kings of old, Cambodia’s deeply superstitious prime minister, Hun Sen, in power for almost three decades, calls on land and water spirits to curse his enemies. Most Cambodians today, while Buddhist, ply spirits with tea and buns at small altars. These days, when neak ta appear on the factory floor — inducing mass faintings among workers and shouting commands at managers — they are helping the cause of Cambodia’s largely young, female and rural factory workforce by registering a kind of bodily objection to the harsh daily regimen of industrial capitalism: few days off; a hard bed in a wooden barracks; meager meals of rice and a mystery curry, hastily scarfed down between shifts. These voices from beyond are speaking up for collective bargaining in the here and now, expressing grievances much like the workers’ own: a feeling that they are being exploited by forces beyond their control, that the terms of factory labor somehow violate an older, fairer moral economy. Early last year, I met a 31-year-old woman called Sreyneang, a worker at Canadia Industrial Park, west of Phnom Penh. She had recently caused dozens of her co-workers to collapse after speaking in the voice of a neak ta. While entranced, she had also assaulted the president of the factory’s government-aligned union, pounding him with her fists and pelting him with insults. We chatted on the dirt floor of the tiny wooden house where she lived; there was nowhere else to sit. She said she had been feeling ill on the day of the fainting, and that the factory nurse had refused to let her go home. She did not remember most of what had happened next, but a spirit healer later explained that a neak ta had entered her, infuriated that a banyan tree on the factory site which had been his home for centuries was chopped down, with neither ritual propitiation nor apology, during the construction of the building. A few months after that event, something similar happened at a sporting-goods factory near the capital that was said to have been haunted ever since it opened in August 2012. Female workers asked their supervisor, a man named Ah Kung, if they could hold a ceremony and offer a chicken to a neak ta angered at being displaced from the site. He refused. Two days later, the spirit entered the body of a young female worker, Sreymom, and claiming, in her voice, to have been “looked down upon,” began shouting in a mixture of Khmer and short, quick syllables her colleagues took to be Chinese. Several dozen other workers lost consciousness and had to be treated at a local clinic. What the spirit was asking for was respect. He demanded that an altar be built and that ritual offerings be made to him there four times a month. He demanded that the owner roast a pig for him and throw a Khmer New Year party for the workers. The owner complied. The faintings stopped. In other times and places, ethnographers have also noted seemingly magical manifestations when indigenous populations first confront industrial capitalism. As the manufacture of linen intensified in northern Europe in the 17th and 18th centuries, household spirits began to appear in textile workshops in a more malevolent form. There was the story about the demonic imp Rumpelstiltskin, for example, who helped a young woman spin grotesque amounts of thread, but only in exchange for her firstborn. Other fairy tales sublimated the distress caused by the environmental and social costs of intensified flax production. The anthropologist Michael Taussig has written about Colombian peasants who were newly incorporated into wage labor on sugar cane plantations in the 1970s and reportedly sold their souls to the devil to increase their productivity. Aihwa Ong, another anthropologist, documented an outbreak of spirit possession in the 1970s among Malaysian women in Japanese-owned electronics factories. These workers often screamed hysterically and attacked their supervisors under the influence of a native spirit called a datuk. Ms. Ong interpreted these acts as a spiritual rebellion against the drudgery of factory life and the rupturing of the women’s longstanding social ties as they migrated from villages to newly established free-trade zones. She also concluded that the spirit visitations did the women little good because they allowed the factory owners to cast the women’s valid complaints about working conditions as mass hysteria. Despite efforts to diversify, the garment industry in Cambodia still makes up around 80 percent of the country’s total exports. Because the economy is so vulnerable to instability in the sector, the government has often reacted harshly, even violently, to garment workers’ efforts to unionize or take any collective action to ask for higher wages. During recent demonstrations, on Jan. 2 and 3, striking workers at Canadia Industrial Park and another factory near Phnom Penh were set upon by soldiers and military police; at least four were killed and dozens were injured. Cambodian workers frequently complain that they are forced to work overtime and threatened when they try to join independent unions rather than one of the many government- or factory-backed unions that have sprung up over the past decade. (For an estimated garment workforce of at least 450,000, by the International Labor Organization’s tally, there are now over 400 unions, according to Solidarity Center, an international labor rights group.) Pro-government and pro-factory unions occupy most of the seats allotted to labor on the national committee that determines wage increases, and their dominance complicates collective bargaining. In September 2010, when the national minimum wage was $61 per month, some 200,000 workers took to the streets to ask for a raise. It was the largest-ever strike in the garment sector, but after just three days it came to an anticlimactic halt due to police violence and threats against union leaders. Hundreds of the striking workers were illegally fired in retaliation. The minimum wage remained the same. Then the neak ta appeared. Mass faintings in garment factories increased exponentially in early 2011, just a few months after the mass strike fizzled. Production lines shut down after the workers’ bodies shut down, and spirits bargained with management on the factory floor. Public sentiment started to shift. During the 2010 strikes, few seemed preoccupied with workers’ rights. Even the foreign media and the Asian Development Bank’s chief economist wondered aloud whether the workers’ demands would hurt the industry. But when the mass faintings began, concern for the workers grew: Were they earning enough to feed themselves? Were they being exposed to dangerous chemicals? Since then, basic pay for garment workers has risen from $61 to $80 per month, and is set to rise again to $100 in February. Numerous conferences on occupational health and safety have been convened. Individual factories, the consortium of garment producers and mass retailers like H&M have commissioned studies of working conditions in Cambodian factories. Garment workers have started to receive monthly bonuses for health and transportation. Not all improvements can be attributed to spirit visitations: The country’s six independent unions have been fighting hard for wage increases. And working conditions still leave a great deal to be desired; labor rights advocates say that $160 a month is the minimum workers need to adequately feed and house themselves. But insofar as conditions have gotten better, it is partly because the factory-floor faintings have reframed the debate. The government’s brutal repression of this month’s strike has shown that it will still not tolerate large-scale collective bargaining. But mass swooning is a rare form of group action that can hardly be suppressed. And now neak ta have been showing up to defend other victims of development. The spirits have appeared at demonstrations and sit-ins organized by the political opposition, which has been contesting the results of elections held in July, which kept Hun Sen’s governing party in power. At protests against urban dispossession in Phnom Penh, traditional animist curses are often levied at state institutions. Salt and chilies are hurled at courthouses, chickens are offered to spirits, mediums summon local gods to mete out justice in land disputes. Last year, in a slum in Phnom Penh, a demonstration by residents who were being evicted by a wealthy landlord was interrupted when a neak ta possessed an indigent woman who lived under a staircase with her mentally ill husband, both suffering from H.I.V. The woman assaulted a local official who was trying to shut down the protest, forcing him to stand down. Previously, the landlord had cut down an old banyan tree believed to be the neak ta’s home. Julia Wallace is executive editor of The Cambodia Daily in Phnom Penh.